American Indian-made Episcopal religious pieces belonging to Bishop Whipple indicate an acceptance of Indian perspectives, and a blending of religious belief systems. 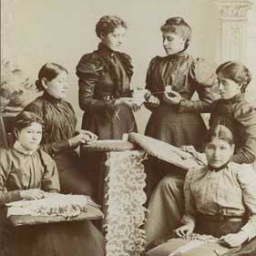 Julia Lawrence was one of the Dakota women involved in lace making with Susan Salisbury at the lace school established by Sybil Carter at Birch Coulee near Morton, Minnesota. The Birch Coulee Mission was later renamed the Bishop Whipple Mission. Moccasins, From/made by Julia Lawrence from Morton to Mrs. H. B. Whipple.